A Pair of Porsche 991/911 Recirculating Valves. These valves are fully customisable to fit your application with two uprated springs provided in the kit. Forge Motorsport's improvement on the original valve has resulted in a compact and aesthetically pleasing design that is fully serviceable, unlike the OEM valve. Coupled with our unique piston design this is the fastest responding DV on the market allowing for an improved throttle response. These valves are competition tested and used on many high performance Porsches - All Forge Porsche parts are Engineered for Performance and Guaranteed for life. Please select whether you want a black or matt silver valve, using the options above. 2 x FMDV008 Valve 2 x Uprated Yellow Spring 2 x Uprated Blue Spring 2 x Cable Tie 2 x 2.5mm Allen key 4 x 35mm Hose Clamps 2 x Instruction Booklet 2 x Forge Sticker. We use DPD 24hr service. Despatch times can vary, depending on what you have ordered. But if the item is going to be delayed longer than 24 hours we will contact you. 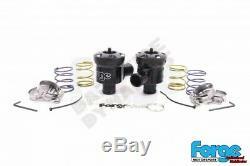 The item "Forge Motorsport Porsche 996 997.2 991 Recirculating Dump Valves FMDV008P2 BLACK" is in sale since Thursday, November 8, 2018. This item is in the category "Vehicle Parts & Accessories\Car Tuning & Styling\Other Car Tuning & Styling".